Some things get better with age and the new 2015 Volkswagen Golf R sports car is one of them. The performance 2015 Golf R has been revealed early and it gets more horsepower than its predecessor. The new performance variant of the VW Golf gets a newly-designed 2.0-liter TSI four-cylinder and it now comes with 296 horsepower to improve the driving dynamics. That’s a healthy 30 hp more than the previous model. The sports car Golf R is set to be officially revealed in Frankfurt next month, but Volkswagen has released details early. That new power translates directly to better performance for the new 2015 Golf R. With a manual transmission, the sports car reaches 62 mph from a standing start in just 5.3 seconds, an improvement of 0.4 sec over the previous Golf R. With the DSG dual-clutch automatic transmission, the car sprints from 0-62 mph in just 4.9 seconds. The Golf R's top speed is electronically limited to 155 mph. Volkswagen engineers have created one of the most powerful four-cylinder production engines in the world. The new Golf R gets an advanced version of the EA888 four-cylinder turbocharged and direct-injection 2.0-liter engine that's fitted to the new Golf GTI. But VW boosted power by 69 hp to 296 and maximum torque has been increased by 22 lb. ft to 280 lb. ft. The newly-designed 2.0-liter turbocharged powerplant is fitted with motorsport style equipment to bump up the power. It features a modified cylinder head, exhaust valves, valve seats, and springs, pistons, high-pressure injection valves, and a turbocharger. The new TSI engine has variable valve timing on both the intake and exhaust sides, as well as two-stage exhaust-valve lift for better performance. The engine comes mated to either a six-speed manual gearbox or a new six-speed DSG dual-clutch automatic transmission that will be offered for the first time here in the U.S. Despite the sports car's extra power, fuel efficiency has been increased by 18 percent. With the manual gearbox, Golf R fuel mileage has been increased from 28 to 33 mpg. Equipped with a Stop-Start system, battery regeneration, and the optional DSG transmission, the car is even more fuel efficient, with an EC combined figure of 34 mpg. The new fourth-generation Golf R will feature the same 4MOTION permanent all-wheel drive system to transfer all that power to the four wheels. Volkswagen reveals it uses new refinements such as the Haldex 5 coupling, that is activated before any wheelspin occurs, eliminating nearly all traction losses. Agility is improved with a cross differential lock (XDS) that acts as a function of the stability control for less understeer during fast cornering. The Golf R features a sport suspension setup that is specifically tuned to the new sports car. Its ride height was lowered by 0.8 inches compared to the base Golf, which makes the Golf R lower by 0.2 inches than the GTI. In the Golf R, the strut-type front suspension has a newly developed lower wishbone and the multi-link rear suspension was enhanced with new tuning of the toe link bearings for improved stability. The Golf R has a Driving Profile Selector with a new “Race” mode that increases engine response and the shift points of the DSG transmission to provide an even sportier driving profile. The DCC also features "Eco", "Normal", and "Individual" modes that have been specifically tuned for the Golf R. As you can see, the new Golf R is built for better performance on the road and track. Outside the flagship Golf R gets special treatments that include special bumpers, side skirts, rear diffuser, dual chrome exhaust tips per side, the lighting design, and standard 18-inch and optional 19-inch aluminum-alloy wheels wrapped in performance 225/40/19 tires. Other Golf R treatments include black brake calipers with the "R" logo, body-color "R"-style side skirts, "R" badges on the front fenders, and "Matt chrome" door mirror caps. As with previous Golf R sports cars Volkswagen R GmbH has extensively upgraded the interior. The most powerful Golf is equipped with what are known as “top sport seats” in the front. The middle panels are designed in "Race" fabric ("Titan Black") with black backstitching and side panels get Alcantara ("Crystal Grey"). An "R" logo is embossed on the backrests of the front seats. As an option, Volkswagen also offers a Nappa-carbon leather package. 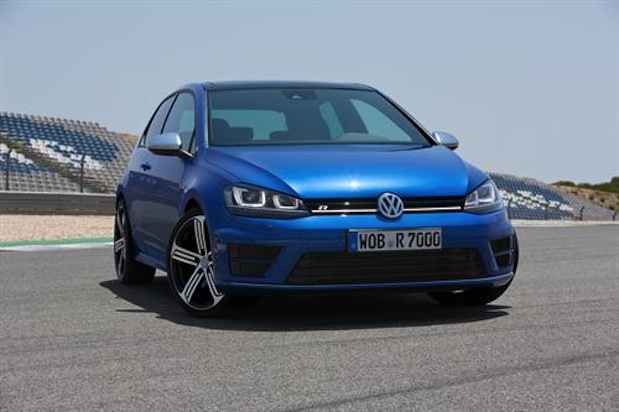 The most powerful and fuel-efficient 2015 Volkswagen Golf R ever will be built in Wolfsburg and launched in the fourth quarter of this year in Europe in two- and four-door variants. The new Golf R sports car will be coming to U.S. shores for performance enthusiasts next year. The performance variant will be officially revealed at the 2013 Frankfurt Auto Show on September 10.